After Suzanne moved to Santa Barbara, CA, she painted landscapes because with a large group of painters who focused on painting the central coast landscapes. 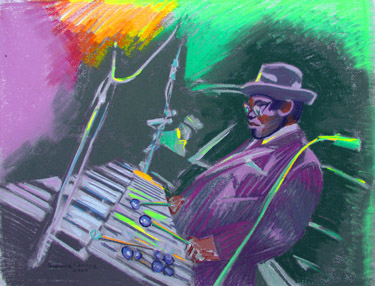 She continued to paint Jazz musicians for 15 years as they performed and was hired by the well known jazz historian, Ted Gioia, to illustrate for articles written about jazz musicians on www.jazz.com. This collaboration allowed Suzanne to share her technical knowledge while imparting certain principles to the creator of the designs.